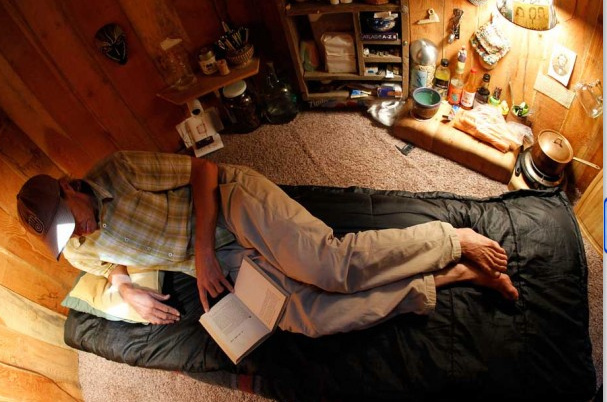 “After 15 years of living in tiny shelters, itinerant artist Dan Price settled into an 80 square foot underground room with one skylight and one small door.” The former photojournalist, surfer, biker and self-proclaimed ‘hobo artist’ decided more than 20 years ago that our modern lifestlye isn’t for him and now spends a lot of time in what many call a hobbit hole. Imagine you being a successful photojournalist, even starting your own magazine (SHOTS), having a wife and kids and living your everyday life. And then, one day, you seem to realise that this is just not for you and that there needs to be a change. 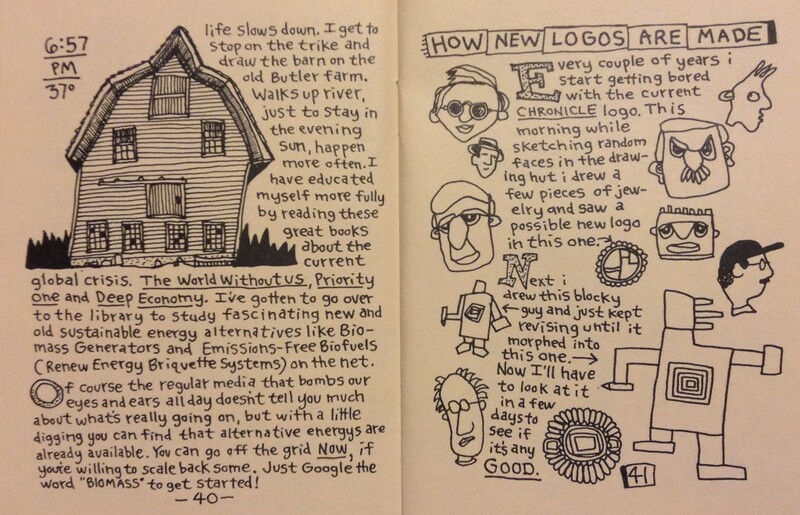 A radical one in the case of Dan Price and if you like to know more about him and his publication Moonlight Chronicles or what kinds of pens he uses for his drawings or how he came to be sponsored by the ‘green’ shoe company Simple Shoes – do have a look. It really sounds like an interesting life, indeed. 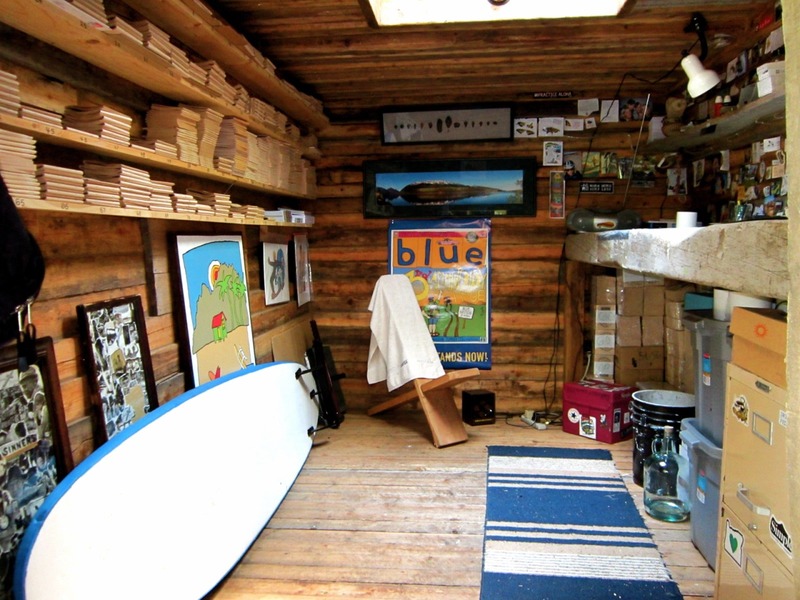 Dan is sharing his time today between his hobbit hole in Oregon and travelling the world – with a particular love for Hawaii where you can find him surfing and drawing. A great interview, even though it is a little older, you can find here and an article recently published describes the Hobbit Hole Office. Now, it is clear that about 99% of all so-called hobbit holes are not in any way comparable to what hobbits actually lived in – and this one isn’t, either – but this story just sounded amazing and I asked Dan a couple of questions of why he is doing what he is doing. Here are his answers. Specifically I really liked the idea of a smallish home. I just kept scaling down on the property from a tipi, to a hut, to tents, then to a 6X10 shed and then to the underground room. My goal has always been to live with as little as possible, hence the tiny space. By the way, I do not feel the least bit cramped. It teaches one NOT to haul a bunch of crap into your living space! If I understand this correctly it has been more than 20 years now since you started publishing “Moonlight Chronicles” and with them you have basically written a chronicle of what you have been up to in those 20+ years. Yes, most all of the adventures i have experienced in the last 20 years were recorded in the Chronicles. I started it in 1993 and ended it in 2012 at issue #77. Each issue was 100 pages, so that is 7,700 pages! At first i had just about 100 readers but then when i got sponsored by Simple Shoes in California, readership jumped to 30,000. We even printed 50,000 copies of some issues. Currently all of the hard copy back issues have sold out and only issue #77 is available as an ebook on my website www.moonlightchronicles.com. Looking back on those years which would have been your most fun year? How to work as a hobo artist. It is difficult to say which of all the 20 years I have been creating the Chronicles was the most fun. Every day was an adventure in looking at the world as a child would, drawing pictures, then each night writing the days story around the sketches. 1997 was pretty crazy with a trip to France where my photographs were featured in a show. That happened twice in France, which enabled me to wander around and draw that wonderful place. In 2001 I rode a Terra Trike 4500 miles from Oregon to Florida. It took 3 1/2 months and was the most difficult thing I have ever done. Then in 2006 the Simple Shoe Company which sponsored my Chronicles for 8 years, sent me on a world tour for 3 months. Amazing experiences in Spain, Japan, New Zealand, etc. You used to be a photojournalist – is there still space for this ‘passion’ in your life or have you completely given this up? Wouldn’t a great scene make you wish you had a decent camera with you and take that particular picture? Like with anything else I do, I went at photojournalism with a full blown passion for ten years. It was very difficult to leave that world behind, but I got out of it in 1990 when we were still printing in darkrooms. I quit because I did not like all the chemicals associated with printing. For me making good photographs was a mentally taxing endeavor and I dont have that kind of intense energy anymore. In 1991 I took up drawing and enjoyed the fact that I could create stories with only a pen and paper. I loved to just wander around like a little kid sketching everything I saw. Are there any upcoming projects/ plans you would share with us – another house/ room, travels? 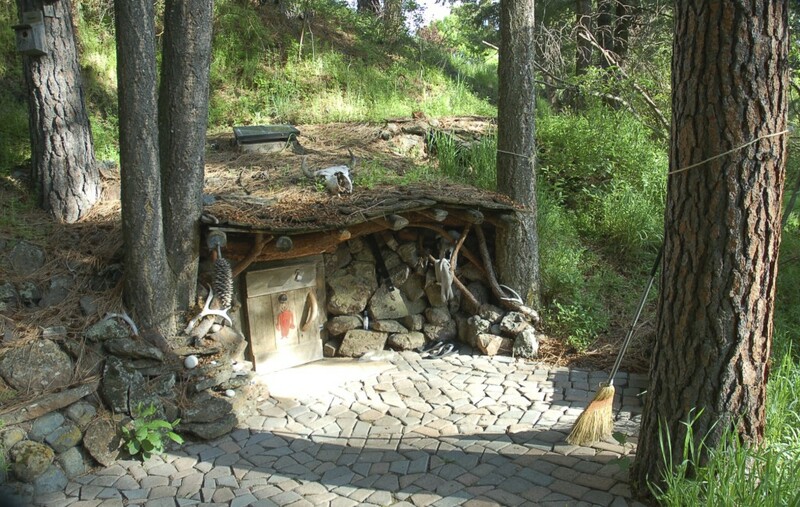 I have always wanted to have an open fire in my Hobbit Hole and hope to rebuild a slightly larger space but with a flame for heating and cooking on. Whenever I smell a wood fire I actually swoon. Such a primal thing. I also like to watch fire burn. Can meditate on it for hours. Besides surfing for the last six winters in Hawaii, I have picked up a second passion that I hope to spend the rest of my life doing. This summer I worked hard to afford a new Zen Handpan steel drum. If you YouTube Handpan you will see what magical instruments they are. They are very difficult to get but I was lucky and secured one this winter. I would like to learn to play it well enough that I could busker myself around the world. That is my new dream. I would probably draw some too and take photos along the way! Thanks to the publicity around the second Peter Jackson film trilogy Dan was even visited by Australian news presenter Denham Hitchcock. Support Dan by buying his books with his website Moonlight Chronicles. Radical Simplicity/My Simple Life is a hand-lettered, illustrated book that speaks directly and elegantly to that craving we all have for an authentic life, one that we’ve each “hand made” for ourselves, rather than one dictated by outside circumstances. Author Dan Price, a Thoreau for the twenty-first century, has helped champion a growing trend that’s been variously referred to as “downshifting,” “opting out,” or “simple living.” What makes his book so different and engaging is that he speaks from the authenticity of first-hand experience, for Price is an American original who has made his dreams a reality. 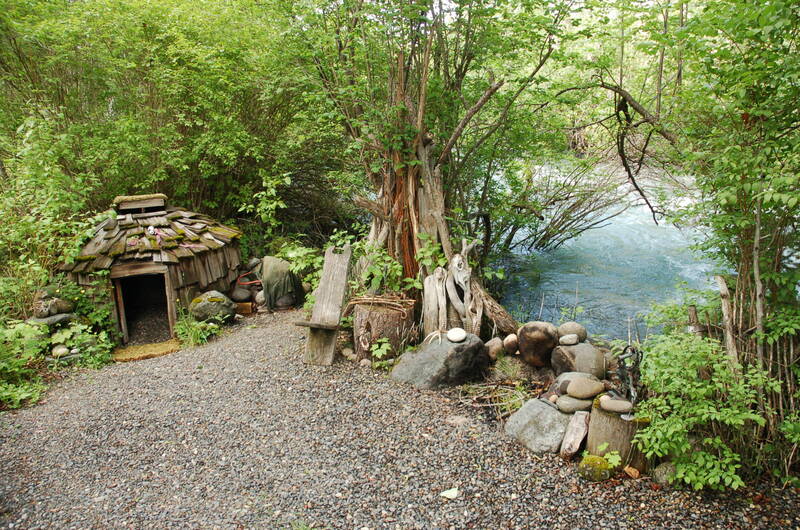 Right beside the river – hobbits need their saunas! Picture credit: All pictures (c) Dan Price.